It’s a question I get asked with astonishing frequency, and one I have yet to formulate an adequate answer to. Because the truth is that, while the two share the title of “city”, they have created for themselves entirely distinct cultures, landmarks, lifestyles, paces, roads, shops, identities. They exist within their own cultivated contexts. What’s more, New York City, for me, will always be synonymous with home––with lazy Sunday mornings spent at the diner on our corner, with walking through the Village until my feet hurt, with subway rides over 9th street at golden hour. It means high school friends and B67 bus rides with my childhood babysitter and the candy jar in my mom’s office; it means snow days and hating Times Square and Easter at my grandparents’ house. As a freshman in college living in University City, Philadelphia is home with a question mark. It is 30th Street Amtrak station. It is that feeling of hard-won comfort and a sense of security in a place that may never be truly your own. But it is also the type of excitement that only a brand new experience, a brand new city, brand new people, can provide. It is weekend trips into Center City and escaping to my favorite coffee shop during finals week. It is bundled walks through Rittenhouse and Septa rides into Fishtown. It was one of those Septa rides that brought me to Suraya, a Lebanese restaurant that is equal parts bright, spacious, and lovely. The food there is delicious, as are the pastries and coffees at the café in the front. 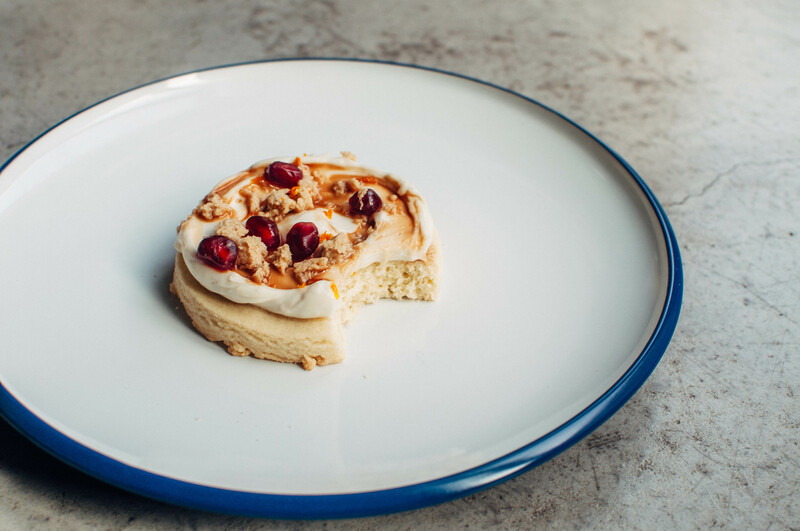 Their tehina yogurt, studded with pomegranate arils and halvah and almonds (then finished with date syrup), is the stuff of my tahini-obsessed dreams, and became the inspiration for this recipe when the memory of it was still stuck in my mind when I returned to New York for winter break. 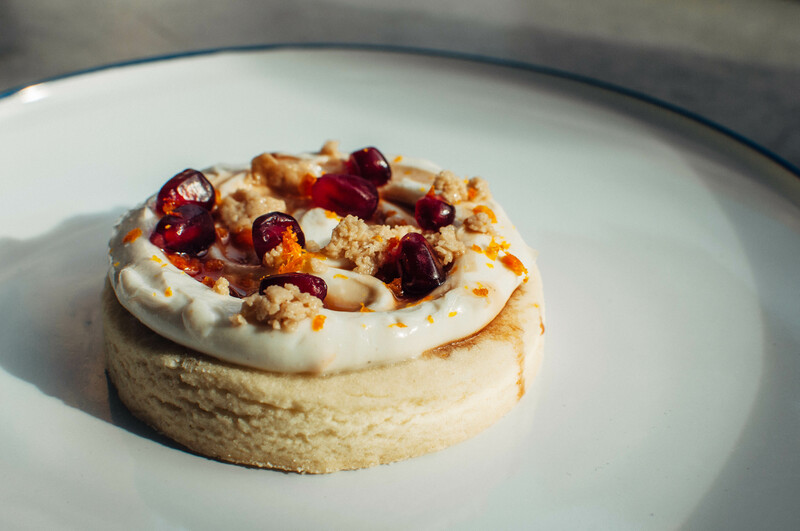 Here, those pomegranate arils and halvah and date syrup find a home on a bed of sweetened tahini-laced labneh “frosting” that is swirled over a soft almond cookie––almost a nod to those thick, frosted sugar cookies you’d beg your parents to pick up at the supermarket. Maybe it’s that faint air of childhood nostalgia, balanced by an adult complexity, that made these cookies a hit. Or maybe it’s that they remind me of old favorites and new discoveries, and, in that, of past and present, New York and Philadelphia, home and home?. Preheat the oven to 350 F. Line two baking sheets with parchment or Silpat. In a medium bowl, whisk together the the flour, almond flour, baking powder, and salt. Set aside. In the bowl of a stand mixer fitted with the paddle attachment, cream together the butter and sugars until pale and fluffy, 3-4 minutes. Add the eggs one at a time, beating after each, then add the extracts and tahini. Add the flour mixture to the butter mixture and mix on low until blended. If you’d like to, you can wrap the dough in plastic wrap and refrigerate for an hour, or up to two days until you’re ready to bake. Or, you can roll out the dough immediately. Roll out the dough on a lightly floured surface to 1/2” thick. Cut out shapes (I used a 3″ circle cutter), re-rolling and cutting any scraps, then transfer to a baking sheet, spaced 1″ apart. Bake until the cookies are just about to begin browning (begin checking larger cookies after 12 minutes, and smaller cookies after 10 minutes). Cool on the baking sheets for 5 minutes before transferring to a wire rack to cool completely. Now, make the frosting: Stir together the labneh, powdered sugar, salt, orange zest and tahini. 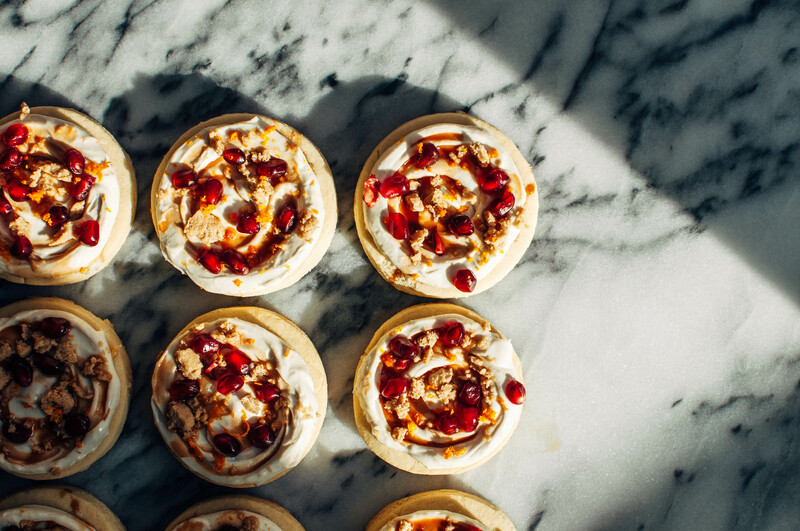 Swirl a hefty dollop of topping onto each cookie, then top with date syrup, pomegranate arils and halvah. Store any leftovers in the refrigerator.